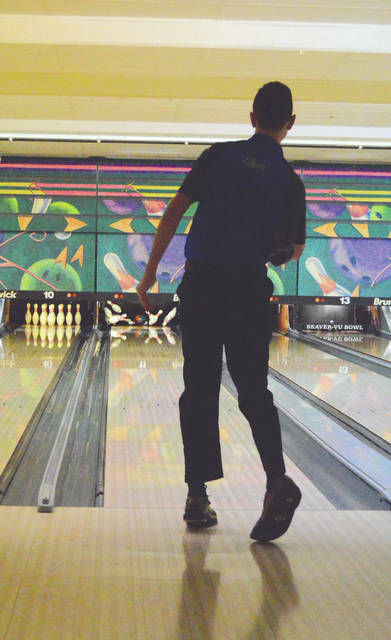 A member of the Xenia High School boys varsity bowling team reacts after throwing a strike during a Nov. 29 win over Springfield, at Beaver-Vu Lanes in Beavercreek. Caity Moody of the Xenia High girls varsity bowling team releases the ball Nov. 29 at Beaver-Vu Lanes in a high school team bowling match against visiting Springfield. 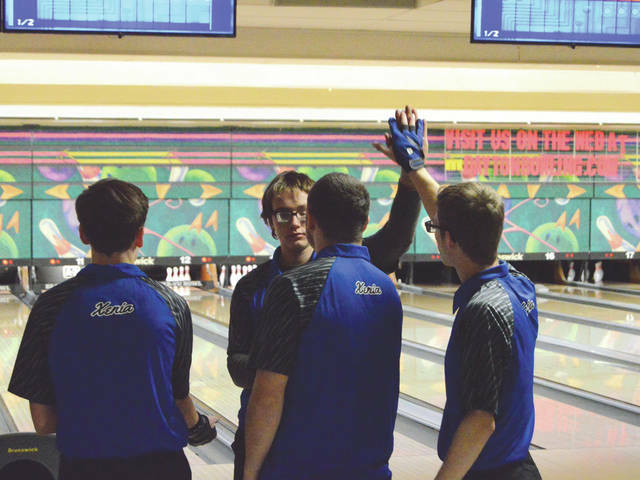 A Xenia High School boys bowler receives congratulations from his teammates after bowling a strike during Thursday’s team match against Springfield. Buccaneers coach Robert Rose said this season’s teams are perhaps the most supportive bunch that he’s ever coached. BEAVERCREEK — High fives were everywhere as the host Xenia Buccaneers earned girls and boys varsity bowling match wins over Springfield, Nov. 29 at Beaver-Vu Bowl. The congrats and encouragement wasn’t just within the girls team, or the boys team, or even the junior varsity teams. 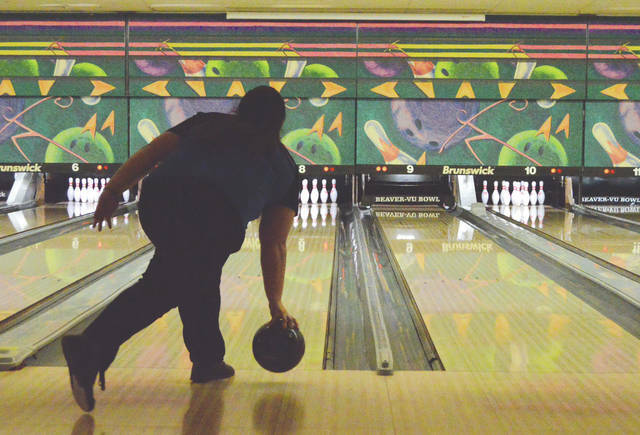 It was a regular occurrence to see a member from the Buccaneers’ varsity girls team go over and congratulate a boys team member, or to see a varsity bowler give a fist bump or a high five after a JV players’ thrown strike. Encouragement abounds among the Bucs this season. “The kids get along really well,” Bucs coach Robert Rose said. “Ninety five times out of a 100, it’s good. But they get along so well at times, that it becomes silliness. It’s a blessing and a curse, but what’s nice is that there is no negative competition between the boys and the girls teams. They’re very supportive of each other. If a girls bowler shoots a 190, nobody’s upset that they got beat by them. Instead, they’re happy for them. There was plenty to celebrate in Thursday’s Greater Western Ohio Conference wins over Springfield. The girls team notched a 2,108 to 1,881 win over the Wildcats to remain undefeated through two matches this season; and the boys earned their first win over the still-young season by a 2,270 to 1,890 score. Senior Kailee Palecek led the girls team with a 191-213 — 404 series. Caity Moody tossed a 188-184 — 372, Gillian Miller rolled a 173-183 — 356, Kelsie Rose turned in a 166-167 — 333 series and Gracie Howell finished with a 127-198 — 325 series in the Bucs win. In the boys varsity match, Cameron McPherson and James McDaniel each rolled two-game series over the 400 mark. McPherson rolled games of 212-204 for a 416 series, while McDaniel had a match-best single game of 241 to go with a 161 for a 402 series. Sam Bahorik rolled a solid 235 single game, Aaron Adkins tossed a 188, Zane Eneix turned in a 167 and Dalton Hinders rolled a 166 single game in the Bucs win. Rose said the boys team didn’t bowl very well in a season opening eight-point loss Nov. 27 to Tippecanoe. Both Buccaneer teams get back in action at noon on Saturday, Dec. 1 in their first regular season tournament. Xenia has been invited to compete in the Ohio High School Kick-Off Tournament, which will be held at the Columbus Square Bowling Palace, 5707 Forest Hills Blvd., in Columbus.